Drop your belief that other people care if your house is clean. Tonight I’m going to a broadway show so I’m getting fancy. The tickets are free because my husband, Jeff, is a musician in the pit. This is why I married him– for free tickets to musicals because I LOVE MUSICALS! What I don’t love, is applying make-up. I don’t like painting my nails. I don’t like wearing high heels. I’d really rather wear elastic waist pants and flats 24/7. Doing this stuff–getting dressed up–today makes me realize that putting on makeup and getting dressed up is like organizing your house. Actually it’s like tidying your house. I may not like to fix my hair or put on evening wear. But I know that once I’m ready and looking good, I feel more confident which in turn contributes to my happiness level. Just like having a tidy house can give people more confidence and increase their happiness at home. Heeyy!! If I straighten my hair and put lipstick on… get out of town I can conquer the world! When I don’t wear makeup I don’t think I’m less valuable or less worthy of respect or money or anything. On the other hand, when I go out of the house with no makeup on nobody ever says anything about it to me. I don’t think they notice! They certainly don’t care. In the same way, when people drop by to pick up their kid from your house, or they bring something over and end up staying to talk a minute they don’t care what your house looks like! Magazines and TV can make us think people and homes are naturally flawless and ready for a photo. Neither is true. So, don’t over-apologize for the state of your house when people are visiting. They don’t care if there are toys on the table or dishes in the sink. They really don’t! Special events like hosting Thanksgiving call for you to tidy up so your guests feel special. Just like going to the theater calls for something nicer than blue jeans. But when people just drop by on a regular day, they aren’t expecting your house to look like a magazine. I’m sure their house doesn’t either! Getting motivated to do regular, upkeep tidying is tricky. Just like for me grooming a little bit extra for everyday doesn’t seem really fun. Straightening an area of your home is a little gift you give yourself. You’ll feel proud and maybe even smile at how nice it looks. Don’t run around putting things away with vitriol in your veins, angry about why you (or your family) left stuff lying around in the first place. Clean it up because your own happiness is all the motivation you need. There are so many tips and techniques out there to help you clean a little at a time. The Fly Lady’s zone cleaning technique is really popular. 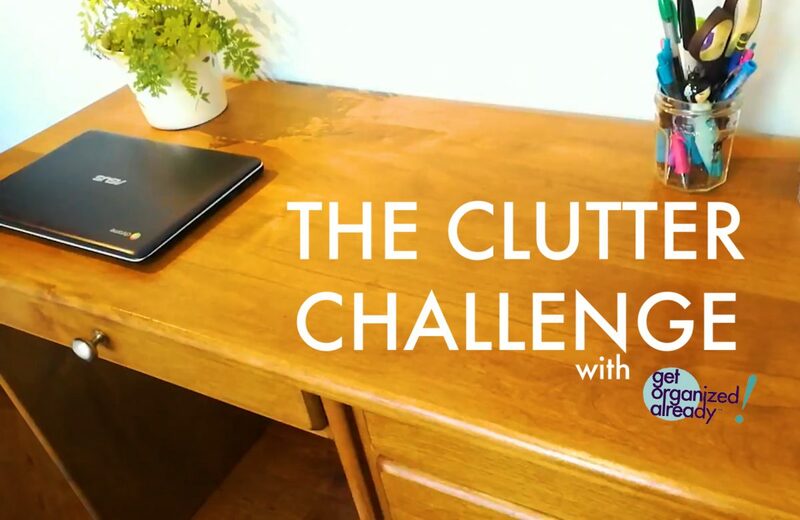 Pick a video from our Clutter Challenge series for 20 minute cleaning of an area. UFYH has some motivating ideas I really like, too. I’m glad you are here. I’m glad you are messy. If everyone were as organized as me, life would be pretty boring. Sincere thanks for reading. Please subscribe to our newsletter by clicking this text. If you are looking for some help organizing or tidying your house, find a local professional organizer to contribute to your confidence and happiness. You are worth it!